Being a nurse is no simple task. They play so many different rolls that it’s difficult to encompass all that they do in just one job title. Though we feel like every week should be Nurses Appreciation Week, it technically falls from May 6th to the 12th. 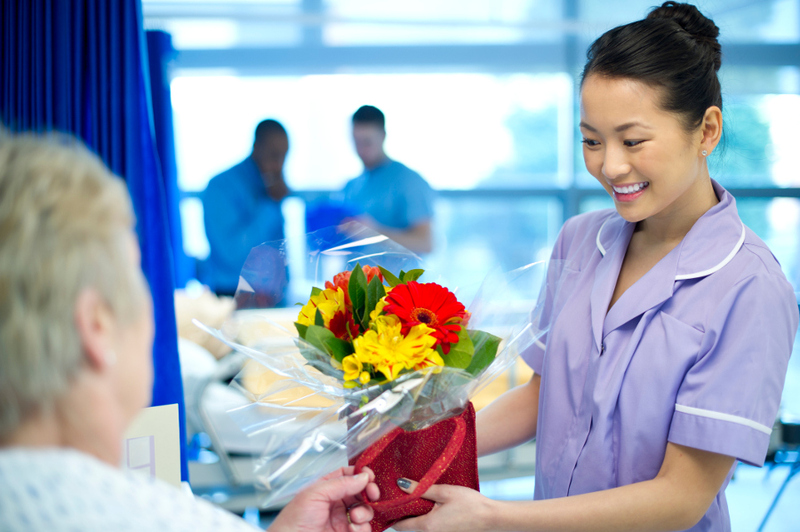 In honor of all their hard work and selflessness, here are just a few of the many reasons nurses deserve to be told “thank you” with a bouquet of flowers. Part of what makes nurses such phenomenal caregivers is that they do actually care about their patients. Whether a patient leaves because they are discharged or because they unfortunately passed away, nurses are affected by every patient they see. While nurses certainly administer medicine and monitor your stats, they are also there for you emotionally. If you’re scared and need someone’s hand to hold, a nurse is typically the first one by your side. For many of us, it’s time to clock out the minute the clock strikes 5 p.m — but nurses don’t have that luxury. They give up their sleep, time, and energy to be at your bedside, whether it’s 5 p.m. or 5 a.m. Most of us could never imagine working on Christmas, after all — it’s Christmas! But for nurses, December 25th and July 4th are just like any other day. While most families are celebrating together and enjoying a nice meal, they’re hard at work, making sure you’re comfortable. Ever since we were little kids, we learned that if you get sick, you go to the doctor. While we certainly don’t mean to undermine the important work doctors do, nurses are often your primary caregiver. In a “doctor’s world,” nurses can sometimes be overlooked. In a 2014 survey, three out of four nurses said they experienced physical or emotional violence while at work. On top of that, they often deal with harmful chemicals, like cleaning products, disinfectants, sterilants, and formaldehyde. Despite what most people think, becoming a nurse requires much more than just nursing school. To become a registered nurse, you must attend four years of college (taking mostly biology, chemistry, anatomy, and nutrition classes), pass the National Council Licensure Examination, and become certified for almost everything under the sun. Needless to say, it takes a lot of hard work and dedication (and maybe a few energy drinks) to become a nurse. From cleaning bedpans to bandaging open wounds, nurses do the dirty jobs plenty of us wouldn’t quite have the stomach for. On any given day, nurses have to take care of patients, both emotionally and physically, fill out and file paperwork, assist doctors and surgeons, analyze labs, and so much more that we’re probably just not aware of. For many of us, just watching a show about hospitals is enough to get our adrenaline pumping. But everyday, nurses have to handle these very real, very scary situations, and they do it with grace and poise. It’s estimated that 60 percent of patients don’t follow their doctor’s orders, so nurses are typically the ones who are running back and forth, urging their patients to do what’s best for them. Without nurses, hospitals, clinics, and doctors offices would cease to exist. Not only are they responsible for caring for patients, but they also handle a majority of the clerical work that keeps an organization functioning. When it comes down to it, nurses literally save lives — and what’s more impressive than that? Sure, they could have chosen another profession, but most of them couldn’t image doing anything else! So though we know these super humans would never ask for the acknowledgement, they certainly deserve it! From bright sunflowers, to the always cheerful daisies, put a smile on a nurse’s face with a bouquet of flowers.